More birds of prey are killed by shock rather than their injuries, so swift action is a prime necessity as any delay increases stress. If you are not trained in handling and examining birds of prey then do not attempt to do either as this too can be stressful. Birds of prey should be kept in warm environments and not allowed to get cold, unless you suspect internal injuries. 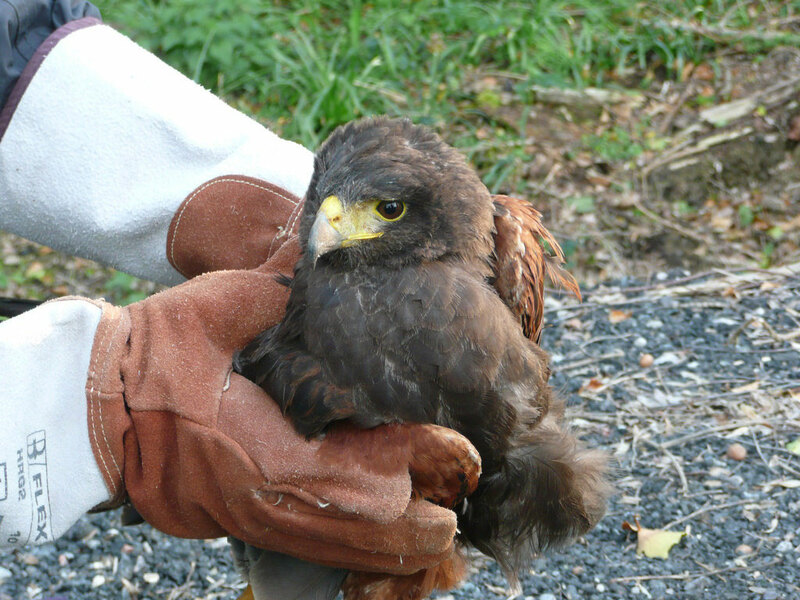 Birds of prey can be transported in anything from a cardboard box to a specialist pet carrier. The container must not be so small that the bird will sustain further damage, but not so large that it can jump around inside. The box should be lined on the bottom with a towel - never use straw or sawdust. Do not place water in the box during transportation. Wire mesh carriers are not the best way of transporting birds of prey as their feathers can become caught and damaged which in turn can prevent then from being released until the following spring. Do not attempt to feed any bird of prey unless you are trained in feeding. Remember to wash your hands, especially after handling meat eating birds which pose a higher infection risk that seed eaters. Many "orphaned" birds of prey are not usually orphaned at all - they are just in the process of testing their wings. Many young birds spread out and away from their nests long before they can fly - this prevents overcrowding in the nest as the youngsters grow rapidly, and is nature’s way of helping to minimise any threat to the entire clutch from predators. Some young birds do lose their footings during these first explorations and fall to the ground. A grounded chick may look lost and vulnerable, but the chances are its parents know exactly where it is and will continue to feed it. Also, many young birds are quite capable of climbing back into their tree using beaks and talons. The most common bird of prey which flies inside buildings is the sparrowhawk. They quite often chase pigeons into factories or warehouses and then have difficulty in finding their way out. However, sparrowhawks are frightened of flying in the dark and they can sometimes be caught by forcing the bird to fly and then switching all the lights off plunging the building into darkness - so best tried at night. The bird will then flutter to the ground and can if you are quick enough be caught and released. Other birds of prey are not so easy and removal can sometimes be impossible.